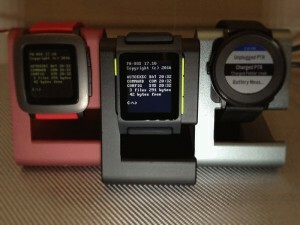 An Open Letter – No, a *Love* Letter – to Pebble and the Pebble Community - ishotjr.com - Put a little mustard on it! I want to start by being clear up front what this is: this is not an even-handed, cold analysis of Pebble’s history and future. It’s not me ranting about what I think they should or shouldn’t have done based on my woefully inadequate understanding of the facts or what it’s like to be in that position or have to make those types of decisions. It’s purely an appreciation of Pebble as a platform and as a people, and a way for me to try to process what’s happened. I’m not here to defend any positions I may take along the way – I’m doing this for me – and should others find meaning in it, that’s just a bonus. As I type this, I am wearing a Pebble Rocks Boulder t-shirt (a perk of attending the event) and Pebble PJ pants (a prize for being the first to demonstrate a working smartstrap connection at the event). 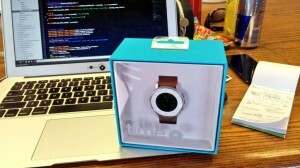 And of course my Pebble 2 (given to me free by Pebble, several months before release). I’m not going to pretend this is my daily uniform (other than the P2! ), but it’s the right one for today. And it helps provide context for how deeply involved and committed to this product and this community I am. Again, do not expect anything but fanboy swooning should you choose to read on! I was extremely excited about Pebble from the moment I discovered the Kickstarter (and experienced Kickstarter itself for the first time). Things did not start off well when my grey Pebble died hours after arrival – that arrival being approximately 9 months beyond the original estimate, and most damningly after the black version was already available to non-backers on Best Buy’s shelves. I’m somewhat taken aback now, reading my description of what has become a beloved device as an “unapologetic lump of plastic and disappointment” and my threats to switch my attention to the AGENT smartwatch, which ended up being an absolute catastrophe of a project. A great Pebble support experience meant a replacement on my wrist and renewed enthusiasm for the product, and it was all uphill from there! 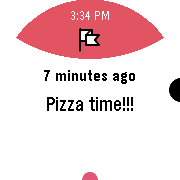 Fast-forward 18 months, and I had published my first Pebble watchface. I’d tried my hand at Pebble development as far back as SDK 2.0-BETA1, but it was with the Developer Preview releases of 3.0 that I really found the tools, documentation, and examples compelling enough to really start getting involved. I’d backed the next-generation Pebble Time and was excited to be up and running w/ the SDK in time for its arrival. The fantastic tutorial, which is still fairly intact today (though expanded upon) just happened to use a DOS font – which is what gave me the idea for my PW-DOS Command Line Watchface – and the silly “enhancements” such as an animated DIR command each minute, “abort, retry, fail” on Bluetooth disconnect, and faux-BIOS splash just flowed from there. The next major chapter for me was attending the Pebble Rocks Boulder hackathon, at which the firmware to enable smartstrap development was made available for the first time. All of my non-Pebble hobby development time is spent with Arduinos, Raspberry Pis, and the like, so the notion of these worlds coming together on my wrist was irresistable to me. I had assembled a prototype before the firmware to support it was even published, and was the first at the event to demonstrate a working connection. And as it turns out, our Altimeter smartstrap ended up winning! Yet as rewarding as our victory was, the best part of the weekend was spending time with other developers, and even actual real-life Pebble employees themselves! In particular, I remember Matthew Hungerford‘s excitement and sheer brilliance, and Thomas Sarlandie‘s incredible helpfulness and vision. Overall it was one of the greatest experiences of my life, and it would not have happened without Pebble’s visionary smartstrap functionality, or their amazing team and approach (shout-out to Viget and Galvanize for organizing/hosting too!). 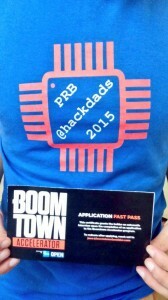 Another major event in my Pebble timeline was attending the Time for Another Round Pebble hackathon in Ottawa, Canada. I’d heard about the event via the the pebbledev Slack channel, but had no serious intentions of driving however far north that was, even for a Pebble event! Then @robisodd and I happened upon each other during some off-topic discussion, wherein it was revealed that we were both in the Metro-Detroit area – and his plans to attend morphed into an exciting joint trip to the frosty north, during which we became fast friends, not to mention met many more, including the event’s organizer, @fletchto99, who even put us up for the night! Our Healthy (Happy?) Hackathon project, which combined Timeline, Health, and Clay integration, as well as a Firebase back end, ended up winning, but again, it was the experience, and friendships made, that were the most valuable part of the event. Sadly, just before the event, Pebble announced significant cutbacks, and the staff that were slated to attend had their travel plans canceled, but @fletchto99 managed to pull off an amazing event, with the help of Music Boss maestro @RebootRamblings and others. Attending the Ottawa event gave me the confidence to do something I’d long dreamed of, but never believed myself capable of: start a local Pebble Meetup. Although we were are a small group, we had have a fantastic time together, sharing projects, ideas, thoughts, and laughs. Providing support for these events was just one more way that Pebble got things right in my opinion, especially when it came to developers. I am continually referencing their documentation and approach when discussing with others what good docs look like, or how to foster community. Their internal hackathons, which I learned of from discussions with employees at the Pebble Rocks Boulder event, are something I have replicated with my own team, resulting in some of our most exciting projects and features. And it’s the community that Pebble fostered that I’ve turned to for support during the uncertainty, then despair of the past week. That community was also behind many other exciting projects that I have had the pleasure of taking part in recently. A discussion on Slack resulted in one of the most fantastic collaborations I’ve ever been involved in: the Pokemon GO Radar Pebble Watchapp, which, despite the back end being crippled by Niantic, made it to number 10 of all time in the Games category on the Pebble appstore. Another amazing community collaboration that I’ve had the pleasure to contribute to was “the book” which is a college-level course in C development, targeting the Pebble platform. The chance to collaborate with many good friends from the community as well as @frethop, while contributing to a valuable publication, was one I particularly relished. Thanx a lot for your team efforts, im still ussing my pebble steel. Thanks – it’s great hearing stories like this from Pebblers around the world! I bricked my Pebble Steel in early 2018. After 12 months of bad-tempered use of Samsungs and Garmins, I bought an almost new Steel from ebay and feel home again. btw: I am using your watchface as a daily driver. I need help I’m try to subscribe my monthly payment for my pebble…it won’t let me. Hi Skyla! I’ve emailed you at the address you used to post this comment – hopefully we can get you sorted!